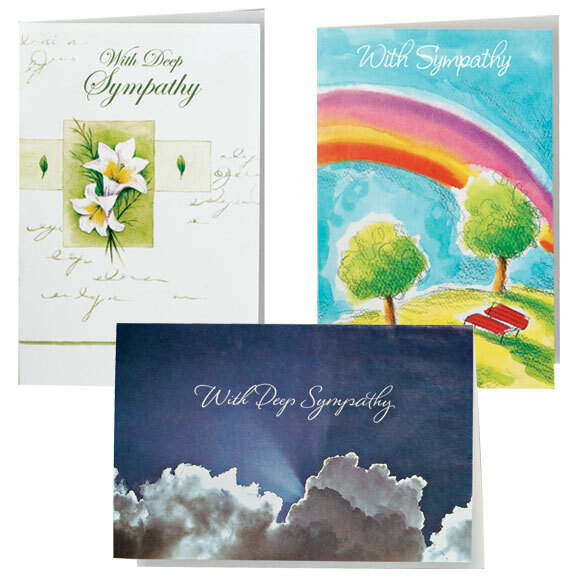 Value pack of encouragement & sympathy cards comes in a set of 24 cards, with 8 unique designs in each set. Each card includes a thoughtful verse and single folds to 4 1/8" x 5 3/8"; white envelopes included. Very nice cards at a great price. Can I order more. They were very well quality and nice. I like the variety of the get well cards. 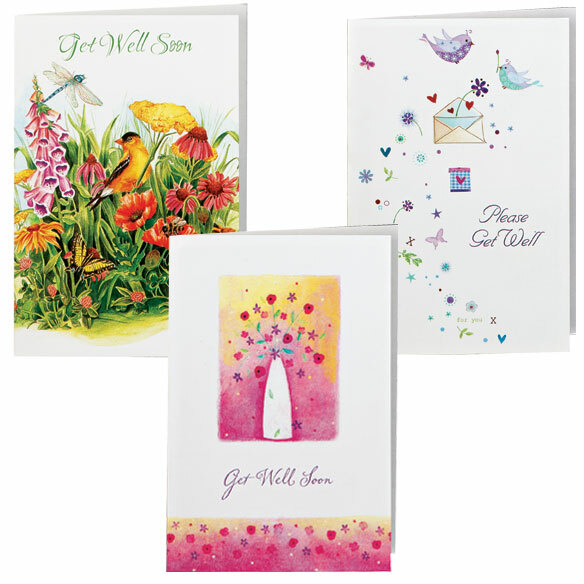 I wish they would sell just get well not Sympathy and Encouragement cards. As always I'm pleased with my selection. I love cards and these are great to keep on hand. They were a great value and the cards are very nice. I send out a lot of cards and I never seem to have enough of Sympathy cards, They are the right size and says just the right thing for the occasion. I purchased all three of the various sets of cards and gave all three to a friend so she did not have to go out to the store to buy cards. 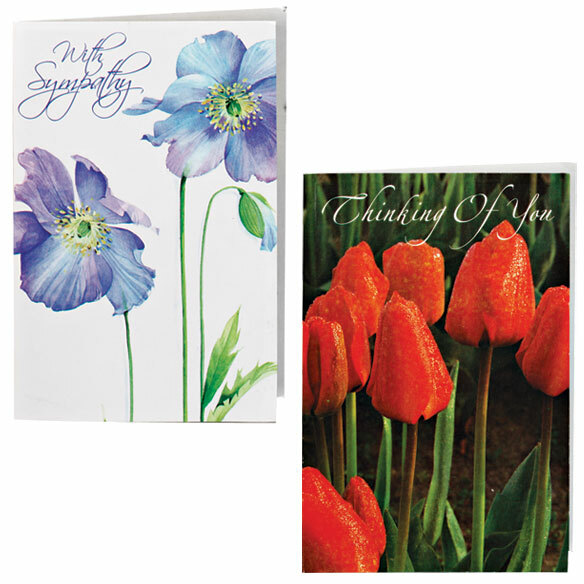 Great cards for Christian values to express Encouragement or Sympathy--perfect for my friends! 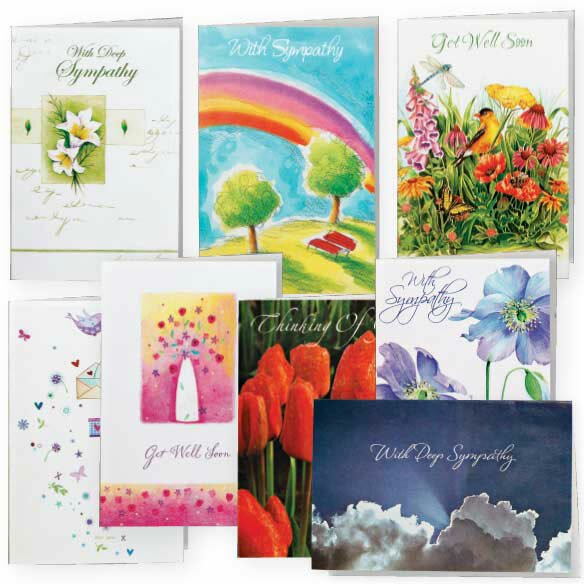 To many "other" cards and not enough sympathy cards. I use this product to sent to the church people and also to others that have lost loved ones. . these have nice verses which are great. the thing that is not so great about it to me is the size of the card i would like them to be 8 x 5 which is the size of the valentine cards also i believe the Easter cards will be that big size. We need a lot of sympathy and get well cards. Your cards have always been very useful and handy especially for last minute needs. Unfortunately, you have made the cards so little I feel a little embarassed using them now. I may not get them in future and will have to look elsewhere for this purchase. I figured I need in case of emergency to respond to someone or send out wishes to friends and family. Variety, Cost effective and great cost. we needed these, and saw them in this book at a good price. To have some of these on hand to send friends and relatives. I like the price for the amount. Its difficult to find cards with Christian theme. We never know just when someone needs some Encouragement and Sympathy. We need to let Family and Friends know we care how they are feeling. I am in a group that writes to soldiers that need encouragement and we also write to families who have lost their loved ones. God bless our soldiers. I like to have these on hand to send as needed! Exactly what I need and and was searching for right price and the exact quantity I need for now. THANK YOU !!! I send a lot of cards; this supply will come in handy as I live out in the country and can't always go into town when I need a card. I do a card ministry for my church and I use all kinds of cards especially encouragement and sympathy cards. I am always running out of cards that are for a specific purpose. I like the assortment. Unfortunately, I have gotten to the age that I need more of these cards than any other kind. I also purchased a set to give to the lady at church who is responsible for sending cards to the church people. I've been on the receiving end of those cards and they are most welcome. Thanks you for a cost effective way to continue this tradition. i send cards to people i know in rest homes. Homebound...cannot get out to buy.